As spring nears, more and more flying insects begin to occupy the night. Come summertime, they’re everywhere. I hate when flying insects get into my home. I must destroy them, as their buzzing and their flybys over and near my family’s heads drive us crazy. When going in and out of my house, my family knows to move quickly. If the front door is open too long, an unwanted flying insect might enter. I can’t sleep if I know there are flying insects in the house. I’ll stay up all night until I destroy them. I’ve been up as late as 4 a.m. trying to kill the same two flies during a six-hour period. My wife hates when I stay up late with such determination to kill these pests in our home. She’d rather have the insects loose in the house. But she married me for better or for worse. 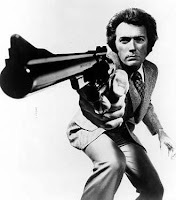 One evening last summer, some TV station ran all of the “Dirty Harry” movies. I stayed up all night and watched them. The next night, when a fly came into my house, I became Dirty Harry: Bug Killer. Using the same dialogue Clint Eastwood used in the fourth “Dirty Harry” film, “Sudden Impact,” I told the fly, “Go ahead, bug, make my day,” as the little bugger whirled around my living room looking for a place to land. Then it made my day and landed on a wall. I rolled up one of my wife’s magazines and spoke to the fly the way Dirty Harry talks to his suspects. The fly looked at me with his beady little eyes, wondering if today would be his lucky day. Then I swung the magazine down upon him. I missed. The same way Dirty Harry Callahan left messes all over the city of San Francisco as he shot .44-caliber Magnum bullet holes into everything around him while going after a suspect, I left messes all over the house. My messes, however, were magazine ink marks all over the walls and furniture, crooked picture frames on walls where I’d swung at the fly and missed, and chairs on the floor that I’d knocked over while running after the fly. “Are you using one of my magazines?” my wife asked. “No,” I lied. “It’s one of my magazines.” She believed me. The fly finally made a deadly mistake. It led me into the bathroom. I shut the door and locked myself inside with him. He’s going down, I thought. If he’ll just land, I can get him. The fly never landed. He just kept flying. You’d think he’d get tired and land. Not this one. He just kept flying around the bathroom. And with stamina developed by chasing my 3-year-old son around my house all day, I kept following that fly around with my wife’s magazine, waiting for the perfect chance to swat him. After about an hour of that, I finally just swung recklessly and repeatedly at the pest. By this time, my wife was in bed trying to sleep. It was past midnight and I was still up trying to kill the fly. With fortitude and skill, I zeroed my concentration in on that fly, and then swung my wife’s magazine one final time. BOOM! Fly guts splattered all over Britney Spears’ latest cover picture. “I got him!” I yelled. I danced around the fly’s corpse, which was lying on my bathroom floor. “That’ll teach you to come into my house, hammerhead,” I said to the fly as if his spirit -- moving on to Fly Heaven -- could hear me. I brought the fly’s corpse out to my front porch to show all other flies outside what happens when they enter my house. As I opened the front door to drop off the carcass, three more flies quickly moved in. “A man’s got to know his limitations,” I said. I knew my limitations. My son would be running me around the house in two hours. I let those flies live. And I went to bed.